Even if you are counting calories, you can afford to enjoy mouthwatering puddings if you cook special low calorie recipes at home. Just cut back on fat content, use extra fruit where you can, and avoid high calorie pastry crusts. You may be surprised how many delicious guilt-free desserts are available to you, just by making little changes to recipes. This is a healthier version of an old-fashioned dessert recipe, which layers fresh breadcrumbs, jam and meringue. This recipe uses much less fat and sugar and has 170 calories per serving. Place the finely grated rind of the lemon in a bowl with the breadcrumbs, butter and 15 grams of the sugar. Heat the milk until hot, but not boiling, and pour on to the breadcrumbs. Mix well, cover, and leave to stand for 1 hour. Separate the eggs. Reserve 3 yolks and 2 whites. Whisk the 3 egg yolks into the breadcrumb mixture, then pour into a buttered 850ml pie dish. Cook in the centre of the oven for 45 minutes at Gas mark 3 (160 degrees Celsius) until the pudding is lightly firm to the touch. Leaving the oven on, remove the dish and carefully spread the jam evenly over the top of the pudding. Whisk the 2 egg whites in a bowl until stiff but not dry. Gradually whisk in the rest of the sugar, a little at a time, to make a stiff and shiny meringue. Spoon or pipe the meringue on top of the pudding. Return to the oven for about 10-15 minutes until lightly browned. Decorate with strawberry slices, or serve them separately. Serve the dessert hot from the oven. This is a high fibre, healthy recipe, to be served warm with skimmed milk custard or yogurt. It has a low calorie count of 155 per portion. Preheat the oven to Gas mark 4 (180 degrees Celsius). Peel, core and slice the apples. Halve the strawberries and toss together with the apples, sweetener, cinnamon and orange juice. Put the ingredients into a 1.2 litre ovenproof dish, or four individual dishes. Combine the flour and oats in a bowl and mix in the low fat spread with a fork. Sprinkle the crumble evenly over the fruit. Bake for 40-45 minutes (or 20-25 minutes for individual dishes) until golden brown and bubbling. Serve warm, with custard or yogurt. This summer recipe is packed with healthy fruit and has 160 calories per serving. Crush the fruit types individually, making sure the skins are broken and the fruit is pulpy. Put all the fruit in a bowl with the sugar and cranberry juice and stir. Leave to soften for 2 hours. Remove the crusts from the bread and cut the slices into strips or triangles. Using a 1 litre pudding basin, fit the bread to line the bottom and sides, reserving enough to cover the top. Fill any gaps with small bits of bread. 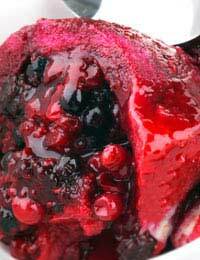 Reserve 2-4 tbsp of juice from the fruit, then gently tip the fruit mixture into the bread-lined pudding basin. Top with the remaining bread. Cover with a plate that just fits within the rim of the basin, putting it directly on top of the bread. Place a heavy weight, such as a can of food, on top and put the pudding in the fridge to chill for 8 hours or overnight. To serve, turn the pudding onto a serving dish. Use the reserved juice to brush or pour over any parts of the bread that have not been coloured. Serve with crème fraiche if liked. One pastry that can be used in a low calorie dessert is light filo. It needs only a brush of sunflower oil between the pastry sheets. Cut it into squares to fit into small patty tins and overlap three little sheets in each tin to form a basket effect. Bake for 6-8 minutes at Gas mark 6 (200 degrees Celsius) until crisp. Cool and fill with yogurt mixed with diced fresh fruit, reserving some for decoration. These have about 130 calories each.